During Power Morphicon fans of the Power Rangers were treated to the Kickstarter campaign of Power Rangers Heroes of the Grid, an incredibly in depth and customizable board game created by Renegade Game Studios under license from Hasbro. The game was incredibly successful on Kickstarter raising over $700,000 when all was said and done. Fans who have backed the Kickstarter will get their packages sometime in July of 2019. 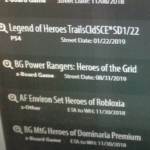 Thanks to @TokuReviews on Twitter, we can now share that video game and collectibles store Game Stop has a street date in their system for the base game – August 31st, 2019! If you didn’t or couldn’t support Heroes of the Grid via the Kickstarter you now have a timeframe of when you might be able to expect the game in stores. Power Rangers Heroes of the Grid Update: $158K Strong And First Stretch Goals Met! In case you missed it, Renegade Game Studio’s Power Rangers: Heroes of the Grid board game went live on Kickstarter the other day and already met its original goal of $100,000 within the first eight hours! The Kickstarter is now on the second day of funding and as of this write up is now sitting at $158,398. This means that the first batch of stretch goals have been unlocked and will be added to anyone who pledges to either the $150 tier or 250 all-in tier. If you’ll be among those attending Power Morphicon this weekend, RenegadeStudios will be there demoing the game so be sure to check them out, and we’ll provide you more updates on this Kickstarter as they become available.